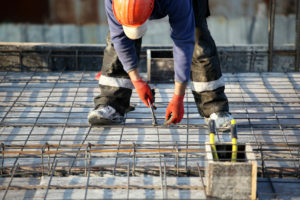 Concrete is one of the strongest and most durable materials to use for construction. It is not weakened by mold, pests or moisture like other materials, such as lumber. It is one of the more fire-resistant building materials, and it does not produce smoke or molten particles. Therefore, it is ideal in locations that are prone to wildfires. Concrete is an ideal building material for areas that are prone to hurricanes and tornadoes. Concrete is especially resistant to storms when it is reinforced. It can handle winds up to 250 miles per hour and can also withstand debris thrown by powerful winds. Because concrete is more durable, it requires less maintenance. Concrete needs to be sealed and should be cleaned periodically. Sealing the concrete protects it from moisture, makes it easier to clean, makes the surface more dust-proof and protects the material from UV radiation. Cracks may form and will need to be sealed in order to prevent moisture from infiltrating. Sealing joints in concrete also reduces the infiltration of dirt, which can otherwise cause the concrete structure to appear dirty. Beyond sealing the concrete and periodically cleaning it, you will not have to worry about maintaining your concrete. Concrete can be used in a broad range of situations. It can be finished in order to resemble other materials using techniques such as staining and stamping. Concrete is more effective at muffling sounds than other materials. A thick layer of concrete can make a building effectively soundproof. This is especially beneficial in more urban areas where louder noises can present a problem. Compared with other building materials, concrete can be excellent for the environment. Because concrete can absorb temperature variations, the material does not require as much energy to adequately control the climate in the building. The quarries used to extract resources needed to create concrete are often rehabilitated, which causes them to have less of an impact on the environment. Concrete also produces fewer carbon emissions than other building materials, causing it to have a lesser impact on climate change. Producing concrete requires less energy than producing other building materials as concrete is produced locally. Other materials must be harvested and then transported to the construction site. The act of transporting these materials produces further carbon emissions. There are newer building materials being created, but they are not as well understood. Construction contractors have been working with concrete for years and understand the limitations of the material. They also understand how to properly reinforce the material and how to seal it. This is important because understanding how to preserve the structural integrity of a building is a crucial part of making it safe. If you need a reinforced concrete structure, give the team at Advanced Post-Tension LLC a call. They specialize in elevated concrete structures that utilize post-tensioning systems and stud rails and they sell the materials necessary to reinforce your concrete buildings.